When George and I started dating I was just moving back home to Connecticut after living 2 years in Pennsylvania. He was working and living in NYC and my move to CT made it the perfect storm for us to become involved with one another. Just a train ride away. He must have really loved me because he was 41 at the time and I was 23 and living at home in CT with my parents… I always thought it was incredibly awkward but funny that he was going to his girlfriend’s parents house for the weekend in his 40’s. But he was an amazing sport about it all. Some of my graduate school friends have been reaching out to me lately about how amazing our love story is. They really saw it from the beginning and had first row seats to see it blossom and flourish. I knew it was special. I’ve always known because arguably it was “love at first sight.” I would come home from graduate school and talk about George to my parents and I was just so smitten from the get go. Which is strange to think about because I was in a relationship at the time with someone who wasn’t George and he was in one with another woman too. But when we got together it was like a locomotive without breaks. We flew and it was amazing the entire time. My ultimate concern is do love like these only come once in a lifetime? Will I be able to find it again? I don’t know. I just go-go-go with my days and if something great happens, awesome. If it doesn’t, well maybe tomorrow it will. Widowhood can lead to a precarious livelihood. I’m learning it more and more as I descend this journey. As a wid friend put it, it’s a continuous balancing act from day to day. We have emotional extremes. George made me a better person when we were together. It was apparent in my attitude toward life and everything. Even in his death I believe he continues to allow me to grow, mature and improve myself. I try to live my life to make him proud, but I do have moments where I’m not okay with my decisions. But I don’t dwell, I learn from them. I know he would want me to be happy and live life to the fullest. Like he did. Okay, I’m not going to stretch this out too much. Basically, I have to learn to love myself and in order to I needed to start taking care of myself. Here’s a side-by-side picture from February to today. All my friends probably are sick of seeing this, but I didn’t realize how drastic of a change it was. George would need a double take of me and then probably tell me my arms are too muscular. But that’s okay, I love it and I am proud. I want to continue to improve and strengthen my soul, body and mind. SoulCycle + cross training + running + lifting = Boom, transformation. 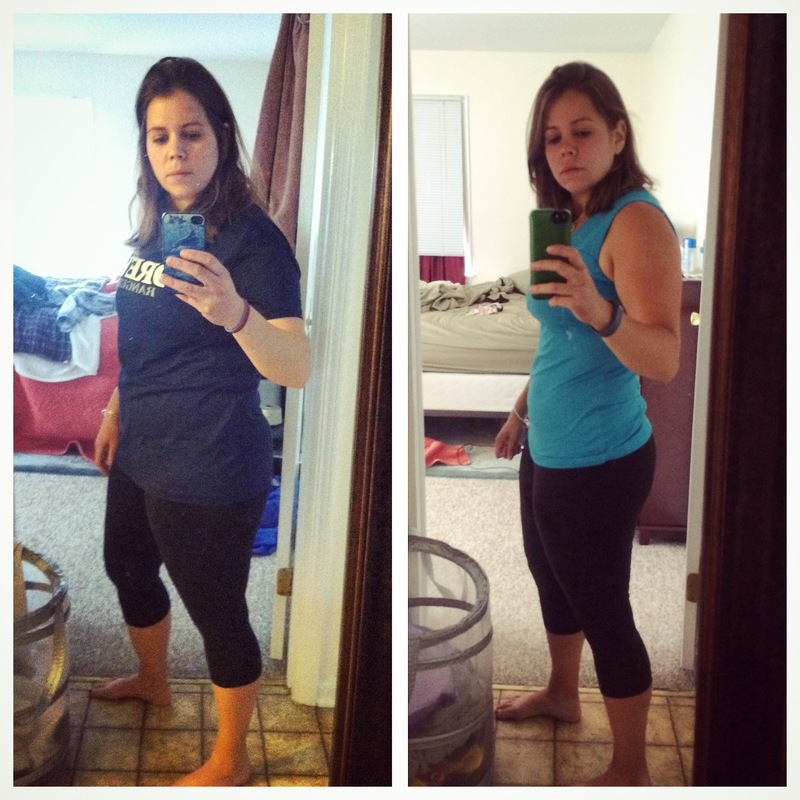 This entry was posted in Uncategorized and tagged bereavement, creative writing, exercise, family, fit widow, graduate school, grief, loss, love, memories, soulcycle, transformation tuesday, weightloss, widow, wilkes university, workout, young widow. Bookmark the permalink.